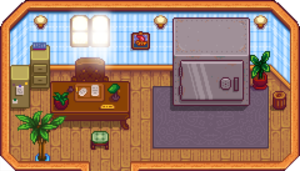 Bundle rewards are given immediately, but rewards for completing all bundles in a room are given at the end of the day via a cutscene depicting the Junimos fulfulling the reward. Note that if you do not collect individual bundle rewards before completing the room, the rewards will be lost when the golden scroll disappears. A few bundles display more items than there are slots to fill (e.g., Artisan Bundle: 12 items, 6 slots to fill). In this case, you can choose which of the shown items you want to use to fill the bundle. You do not have to use all shown items, only enough to fill the slots. Bundles which do not specify a quality will accept items of any quality. However, for bundles that need multiple items, all the items must fit in the same stack. For example, to fulfill 10 Wheat for the Fodder Bundle, you need 10 regular-quality wheat, or 10 silver-quality wheat, but not 5 regular and 5 silver. 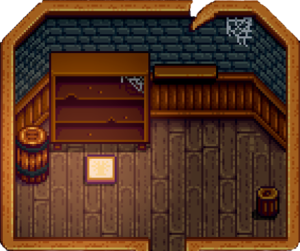 Completing all bundles restores the Community Center back to brand new and unlocks the "Local Legend" Achievement. 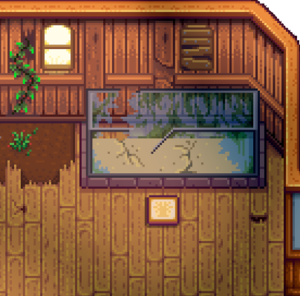 That night, the game also unlocks a cut scene that shows the grand re-opening of the Community Center. This scene is triggered by entering Pelican Town Square any time thereafter on a sunny day, unless a festival is to be held in the town that day. 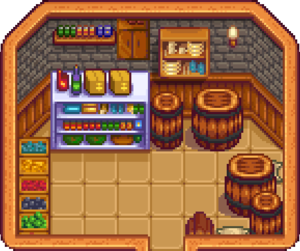 If you opt to purchase a JojaMart Membership, the Community Center is turned into a Joja Warehouse instead. 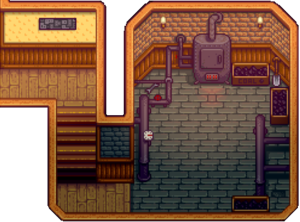 After this happens, the bundles will be completed by the Joja Corporation for a fee given to Morris, the local JojaMart manager, through the Joja Community Development Form. 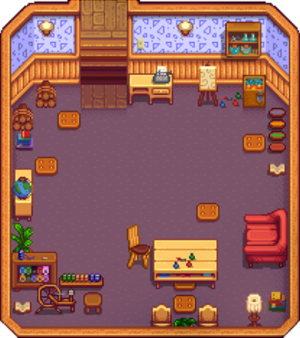 There is a total of 6 rooms and 30 bundles to complete in the Community Center. 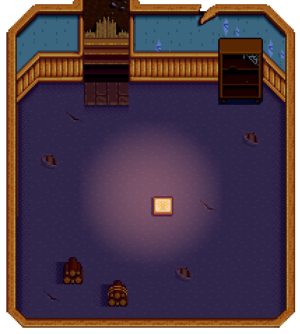 In the Joja Warehouse, there are 5 rewards to purchase (the "Friendship" reward is not available). Bundle Progress can be checked at any time by clicking on the Golden Scroll icon at the top right of the Player Menu (above the Garbage Can and "organize" icons). The Crafts Room contains the first group of bundles available. Completing all Crafts Room bundles repairs the bridge east of The Mines, giving you access to the Quarry. Red Mushroom Foraging in The Mines, Summer or Fall Foraging in the Secret Woods, The Farm Cave (mushroom option), Tapping a Mushroom Tree, Forest Farm Map in Fall. The Pantry appears after completing one bundle. 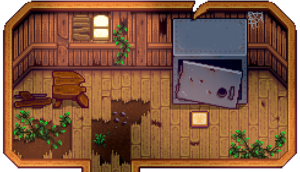 Completing all Pantry bundles will restore the dilapidated Greenhouse on your farm, making it available to grow Crops and Fruit Trees year-round. 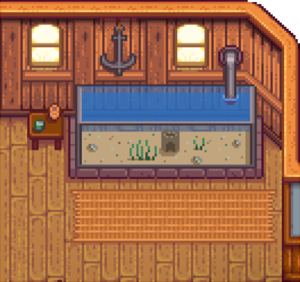 The Fish Tank appears after completing one bundle. Completing all Fish Tank bundles will remove the Glittering Boulder to the left of The Mines entrance. 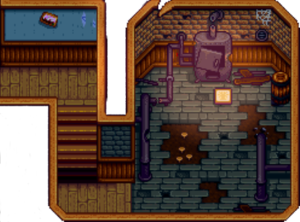 Willy will also give you a Copper Pan that can be used to collect metal ores and other items from bodies of water. Note: It may not be possible to finish the Specialty Fish Bundle before finishing the entire Vault section, as you need access to The Desert to get a Sandfish, unless it becomes available at the Traveling Cart. Sunfish Found in Rivers, 6am – 7pm, Spring, and Summer during sunny weather. Found in the Riverlands Farm or in the Wilderness Farm pond during rainy weather. Catfish Found in Rivers and Secret Woods Pond Anytime, Spring and Fall. Only when raining. Shad Found in Rivers, 9am – 2am, Spring, Summer, and Fall. Only when raining. Tiger Trout Found in Rivers, 6am – 7pm, Fall and Winter. Largemouth Bass Found in the Mountain lake, 6am – 7pm, All Seasons. Carp Found in the Mountain lake, Anytime, All Seasons. Found in Cindersap Forest pond, Anytime, Spring, Summer, or Fall. Found in Secret Woods or Sewer, Anytime, All Seasons. Bullhead Found in the Mountain Lake, Anytime, All Seasons. Sturgeon Found in the Mountain Lake, 6am – 7pm, Summer and Winter. Sardine Found in the Ocean, 6am – 7pm, Spring, Fall, and Winter. Tuna Found in the Ocean, 6am – 7pm, Summer and Winter. Red Snapper Found in the Ocean, 6am – 7pm, Summer and Fall. Only when raining. Tilapia Found in the Ocean, 6am – 2pm, Summer and Fall. Walleye Found in Rivers, Lakes and Forest Pond, 12pm – 2am, Fall. Only when raining. Bream Found in Rivers, 6pm – 2am, All Seasons. Eel Found in the Ocean, 4pm – 2am, Spring or Fall. Only when raining. Pufferfish Found in the Ocean, 12pm – 4pm, Summer during sunny weather. Ghostfish Found in ponds in The Mines levels 20 and 60, Anytime, All Seasons. May also be dropped by Ghosts. Sandfish Found in the pond in The Desert, 6am – 8pm, All Seasons. Woodskip Found in the Secret Woods, Anytime, All Seasons. The Boiler Room appears after completing two bundles. Completing all Boiler Room bundles repairs the Minecarts, allowing you to fast travel between distant locations. The Locations are Bus Stop, Mines, Quarry and Town. 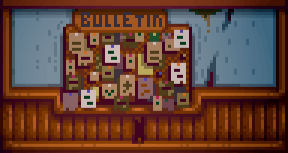 The Bulletin Board appears after completing three bundles. 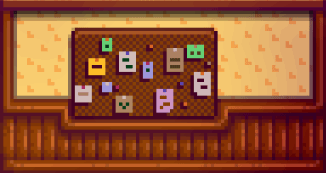 The morning after, Mayor Lewis will send a letter saying that packages containing items posted about "years ago" on the community center bulletin board have been appearing in villagers' homes. He says the packages are all addressed from "your farm." He expresses his gratitude and says "all of us in town are delighted!" Chub Can be found in the mountain lake and river during all seasons, any time. The Vault becomes available after completing four bundles. Pressing the large "purchase" button will purchase the bundle and deduct the gold from your total. Completing all Vault bundles costs 42,500g, and repairs the Bus Stop. Taking the Bus grants access to The Calico Desert. 1.3: Removed an exploit that allowed some furniture to be used in place of items to fill bundles. This page was last modified on 19 April 2019, at 22:59.